“INCREDIBLES 2” features family crime-fighting. Written and directed by Brad Bird, this film gives us a new look at the family of closeted super-heroes who must balance their passion for justice with the restrictions of a society which has outlawed men and women in capes and Spandex. For this iteration, there’s the issue of what it means to be a man and father in a modern world in which women are taking an increasingly commanding role. The animation is letter-perfect; smooth and striking at the same time. The voice acting – matched with the computer generated action – by Craig Nelson (Bob Parr/Mr. 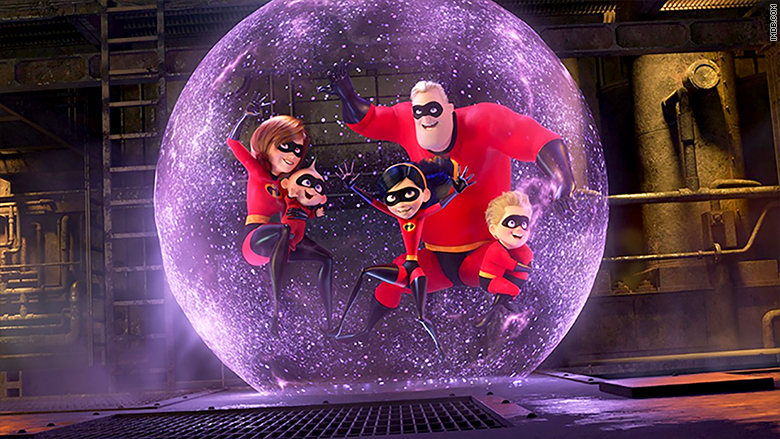 Incredible) Holly Hunter (Helen Parr/Elastigirl), Samuel Jackson (Lucius Best/Frozone) and Bob Odenkirk (Winston Revour) – is so perfectly meshed you almost forget that you’re watching a cartoon until the baby bursts into flames. Here’s the premise. Still banned from being public heroes, the door cracks open a bit when a huge corporation lures Elastigirl out of the shadows to lead the charge for legalizing the superhero profession. That throws Mr. Incredible into the background as a fatigued Mister Mom. Of course, there’s got to be more to a superhero story than an enhanced middle-aged crisis. There’s a surprise villain, some social commentary about civic laziness and a happy ending. It’s not exactly a kid’s movie; it will resonate more with parents than the pint-sized. Despite the Biff-Pow-Wham – it feels grown-up in the way it amusingly uses the superhero concept to take on some super interesting issues in society. “Incredibles 2” is rated PG for cartoon violence.